In the entire globe the use of smart phones has extensively heightened. One in five people in the world own a smartphone and 85% of people go for native mobile apps to websites. We need to understand that mobile apps allow users to have all the message they need to know about you at their fingertips. Mobile app has the ability to bring to you the customers and retain them. Companies need to leverage latest technology and find new ways to engage and interact with their customers. Mobile apps require a various inventive design. 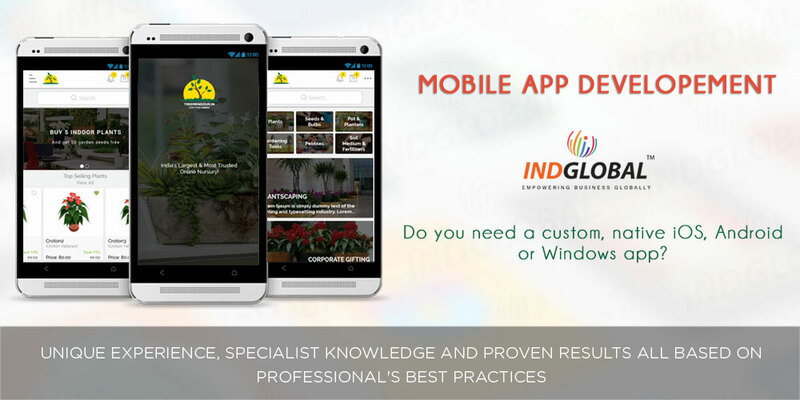 IndGlobal is aMobile app Development Company in Bangalore -Indglobal, specializing in Android application development, IOS application development, Windows application development. A passionate team of various platforms of Mobile app developers associate with you and convert your innovative ideas into a brilliant app for your business. We map your concept, make wire frames, graphic designs, do the coding and launch into google play store. Through all these consecutive process we keep you informed of all the development made every so often. We are capable of handling different categories of apps from entry level to the most complex apps all at an affordable price. Mobile app development has been our passion and ever since we started we are successfully running this business. It's been a joy to work with our clients and enduring awesome experience of developing a range of different Mobile apps which was basically a creative and innovative ideas of our clients that we brought into life. This creative development will help you acuminate on the mobile app that will meet your goals. Some of our clients come with exact idea and prospect about the mobile app while other are not sure how to best utilize this technology for the benefit of their business. We meet them and together we plan and come up with very creative solutions that will help them engage with their customers or streamline business.